Remember that these Decision Aids are designed to be used primarily for the clinical encounter when patients and physicians engage in shared decision making. This is why you should aim for simplicity and readability, rather than having to much detail and information. A first version of the decision aid is automatically produced from the evidence summary of the corresponding PICO (including practical issues). To do so, simply unselect the outcome(s) you don't want diplayed. 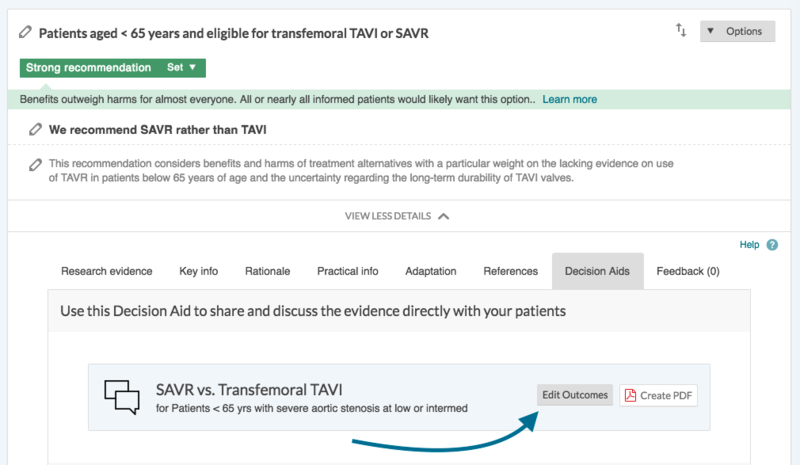 Note that, by default, all outcomes and new outcomes in the evidence summary are automatically selected and displayed in the corresponding decision aid. Re-word each outcome to make language simpler or more in line with lay language. For example, you may want to reword "Acute Myocardial Infarction" into "Heart attack"; or reword "Moderate/severe heart failure symptoms (NYHA ≥III)" into "Heart failure symptoms". To help you choose which outcome to reword, the dialogue box shows you both the full outcome name, and the outcome short name used in the summary of findings tables (if you've entered one). The third column allows you to enter a simpler label for the decision aid only. Aim for short and simple outcome labels, so that the decision aids are not too crowded and can easily support the conversation between patients and clinicians. Remember that clinicians would always have access to the full evidence summary before using the decision aid with patients! Some recommendations and supporting evidence summaries may be less prone to shared decision making with patients - e.g. more techchical, directed to clinicians alone, or informing a system-level decision making. In such instances, you may want to altogether hide the corresponding decision aid. The Hiding/Showing decision aids in published guidelines is a upcoming feature expected in beginning of april 2017. The outcomes are displayed in the same order in the decision aids as in the evidence summary. To change the order, you need to go to the evidence summary in the PICO itself and use the arrows in each outcome line to move them up or down. Changes in order will automatically be displayed in the decision aids accordingly. Always Remember to specify the time frame (eg "at1 year") for each in the specific box in the PICO evidence table. When done so, the time frame will be automatically displayed in the outcomes cards in the decision aid as well! In general, try to NOT specify the time frame in the outcome label. The only time you may want to display the time frame in outcome label is when you want to show the same outcome at different time frames (e.g. at 1 year, at 5 years, at 10 years). In this case - and only in these cases - including the time frame in the outcome labels will rapidly help distinguish them when using the decision aid with patients. All this information will be automatically shown in the decision aid, and the corresponding graphics. To correct any mistake, simply correct the information in evidence summary of the corresponding PICO question.